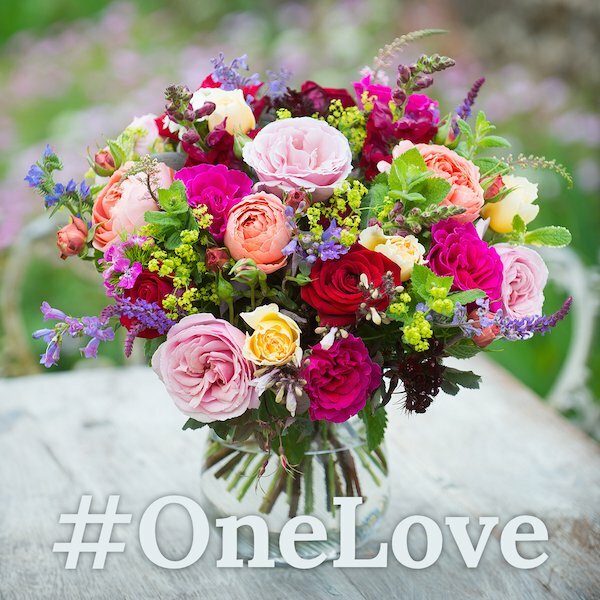 Our #OneLove bouquet is full of English roses such as Deep Secret, Irish Hope, Frederick Mistral, Big Purple & Romantic Antike from our Hampshire farm. The scented garden roses are hand tied with a selection of English grown wildflowers. We wanted to recognise the amazing strength, spirit and solidarity displayed in Manchester, London and indeed across the country in recent weeks with our #OneLove bouquet. For each bouquet sold, we will donate £2 to the British Red Cross solidarity fund set up to support victims of terror anywhere in the UK.